The Jones Mountain Twin Splitboard gives creative, freestyle-inspired riders an awesome new shape option for getting rad in the backcountry. Built with Jones moderate flex Mountain Core and a CamRock directional twin shape, the Mountain Twin Split is the playful and creative standout in the often stiff and serious world of backcountry travelers. CamRock  A unique rocker/camber flex pattern defined by evenly balanced tip and tail rocker and camber between the bindings. CamRock improves freestyle finesse by keeping your tips playful while maintaining the power and pop of camber underfoot. Mountain Core  Dual-density full wood core with hardwood bamboo stringers for added pop and durability. Triax Fiberglass  Multi-axis, stitched fiberglass laminate that offers a precise and responsive ride in any terrain or snow conditions. Sintered 7000 Base  Durable natural base material with added ­carbon for speed and good wax absorbency. Inside Traction Tech 2.0  Inner edge Traction Tech improves splitboard edge grip on ascent. Three side cut "bumps" on each side of your binding keep you locked in on icy skin tracks no matter which way you are traversing. Outside Traction Tech 2.0  Like a serrated knife slicing into the snow, Traction Tech improves your edge grip by adding multiple contact points along the running length of your board. 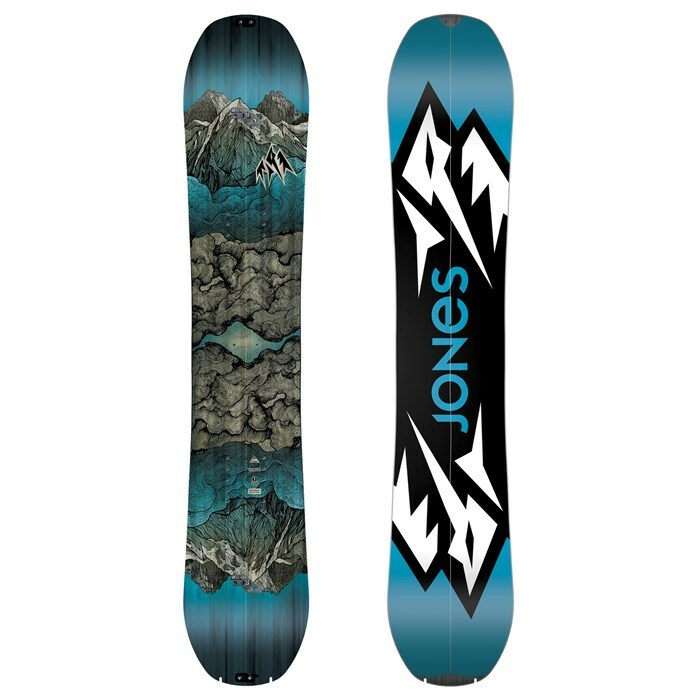 Karakoram STD Clips  Jones Splitboards feature Karakoram K-Clips plus tip and tail hooks. Adjustable tension K-Clips increase board torsional stiffness.